Maybe you have tons of videos shot with your iPhone(iPhone 6S/6/6/Plus) and you want to burn them to DVD for playing on your home DVD player/TV, for long term storage or just to free up some space on your iPhone. Actually, it's very easy to convert iPhone video to DVD using the right method. What you need to do is to transfer the iPhone videos, usually MOV or MP4 files, to your computer and get a DVD burner to burn iPhone video to DVD disc. There are various DVD burning programs in the market while Aimersoft DVD Creator stands out because its ease-to-use and high compatibility with video formats and DVD disc. With it, you can fast copy iPhone video to DVD disc for watching on any standard DVD player and TV. Besides, iPhone MOV and MP4, it can also convert AVI, WMV, FLV, MKV, ASF, TOD, MOD, etc. files to DVD with superb burning speed and excellent output video quality. If you're using a Mac, please get Aimersoft DVD Creator for Mac to burn iPhone video to DVD on Mac (including Mountain Lion, Mac OS X 10.9 Mavericks, Mac OS X 10.10 Yosemite and Mac OS X 10.11 El Capitan). 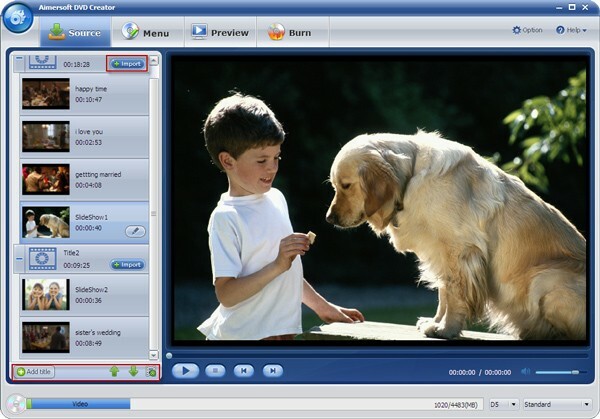 Burn MP4 video to DVD with super fast speed and high-quality output. Support most popular videos, photos, and audio files formats such as MP4/MP3/MOV/AVI/JPG/PNG/TIFF and more. Provides 100+ free static and dynamic menu templates for your needs. Built-in video editor to personalize videos by Trim, Crop, Add subtitles, Apply Effects, etc. This guide uses DVD Creator for Windows screenshots. If you are using a Mac, please download the Mac version and follow DVD Creator for Mac user guide to finish converting iPhone video to DVD on Mac OS X (El Capitan). Run the DVD burner and click "Import" or drag and drop to import the videos you want to burn. You can also add photos to make a photo DVD slideshow. When all the files are loaded, you can organize the video sequences and preview them. Select a video clip and choose Edit to open the Video Edit window, where you can crop, trim, adjust effects, add watermarks, rotate, etc. to customize your iPhone videos before burning. You can select a DVD menu template under the "Menu" tab. More than 40 free static and dynamic DVD menu templates are provided for your choice. You can even add text, background music and background image to customize the menu. If you don't want the menu, simply choose "No Menu". When all the settings are OK, insert a writable blank DVD disc to your computer DVD drive and go to "Burn" tab and click "Burn" button to convert iPhone video to DVD. You can also save the files to ISO image file or DVD folder for burning later.